Let’s Get Smaller and Smarter! The gavel dropped opening the 2017 legislative session on Monday, with renewed optimism for government efficiency and less of a burden on taxpayers. Speaker of the House Linda Upmeyer told Iowa Public Radio she would look for an opportunity to “…put more tax dollars in the taxpayers’ pockets. We should at a minimum be able to look at simplifying our tax code,” referencing an income tax system that hasn’t seen a reduction in its highest rate since 1998. 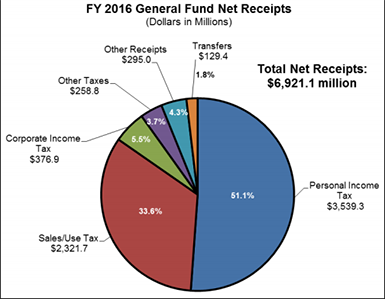 While many elected officials have expressed a desire to shrink government and return money to the taxpayer, information from the Iowa LSA indicates the $6.921 billion in tax revenue received by the state’s general fund in fiscal year 2016 was the largest amount ever with 51.1% of the total net receipts coming from personal income taxes. 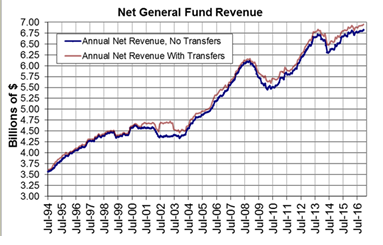 As the chart below shows, general fund revenue has SKYROCKETED since the mid-1990s. With Iowa’s political leaders voicing their desire to create a smaller, smarter government, and return dollars to the taxpayers, the new legislative session IS the time to make significant progress towards those goals. The Iowa Senate led the charge by filing Senate Joint Resolution 1 (SJR 1), a proposed amendment to the state’s Constitution that would limit spending to 99% of available tax revenue. While the 99% spending limit already exists in statute, this constitutional amendment would be an even stronger restraint. Having meaningful reduction in spending, opportunities for substantial tax cuts can occur. Iowans for Tax Relief will be closely following the progress of this and other important pro-taxpayer relief this year and our registered lobbyists will be working for you the taxpayer at the state Capitol, all session long. Follow us on Facebook – @IowansforTaxRelief or Twitter – @ITRWatchdog to stay updated daily. “We’ve been warning as a caucus that the level of spending was accumulating to a point where this kind of crisis was going to occur, and we’re prepared to fix it,” Dix said. “We’re going to fix it. Limit future tax and spending increases with constitutional amendments. Iowa’s GOP lawmakers see tax policy changes a 2017 must-do. It’s been 20 years since last income tax cut – but can state afford one now?